Welcome to my blog, so happy you are visiting me today! 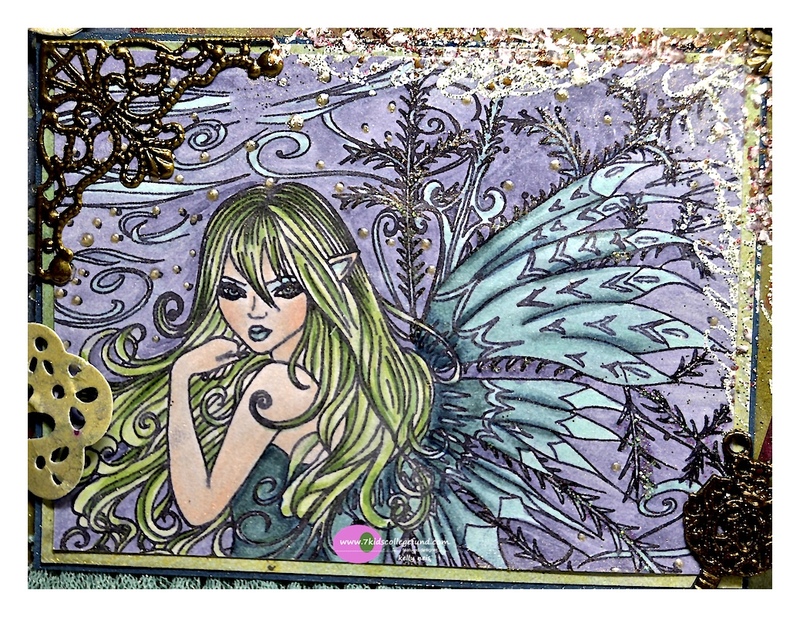 7 Kids College Fund Store is carrying a new artist from Sweet Pea stamps, Charmaine Flannery. I like her stamps and the paintings she does are amazing. I happened to win one of her paintings from her Ebay store so of course I was very happy to see the 7 Kids store carry her stamps! Here is my card using Snowflake Fairy by Charmaine Flannery. I went through many sheets of paper to get her colored as best as I could. I used Copics and some glitter for sparkle. The top and right edge is Shabby White Frantage. I used some metal corners, key and butterfly to make it more edgy like the artist is. My papers are Moulin Rouge by Prima. My flowers are from Wild Orchid Craft and they are Frantaged in Shabby White, Aged Wine, and Aged Aqua. I glued them onto a Magnolia Doohickey flower die made from the paper. The top of my card I inserted a brown paper bag and dabbed it with Distressed Stains, Aged Mahogany, Bundled Sage, and Tumbled Glass. This is the first time using them and of course most of it is covered up. I really enjoyed the effects they made on the paper bag. After it dried I added a bit of Wine Frantage. The tag is a Magnolia Doohickey die and I also Frantaged that in Aged Wine after stamping in Versamark Ink. Here are some views of the other flowers with frantage on them. I frantaged all around the edges with Aged Wine and used a La La Land heart doily die along the side. She was fun to color after I got the hang of her even though I had to push myself out of my comfort zone. I will have to do more of her. 7 Kids College Fund Challenge Blog has a ANYTHING GOES challenge running and you can win a gift certificate to the 7 Kids College Fund Store by using a image currently available in the store. More Shopping!! Did you know that 7 Kids has a Pinterest board!! Their store board is here and the Top 3 Winners board is here. Go check them out! Thank you for being here and taking the time to leave me your comments, I truly appreciate it! Absolutely packed with gorgeousness. Just so love the colouring and fringe at the bottom. My oh my this is awesome! You showed a real beauty WITH paper! Oh wow ! this is gorgeous ! So nice colors, fab design, lovely work my friend ! Wow - those frantaged flowers look amazing, especially layered up over the lovely painty/inky diecuts. Beautiful layering of all the elements... I especially love the little tag and bag with the gorgeous ribbons at the top. Fabulous, Kelly! Kelly this is a fantastic creation. 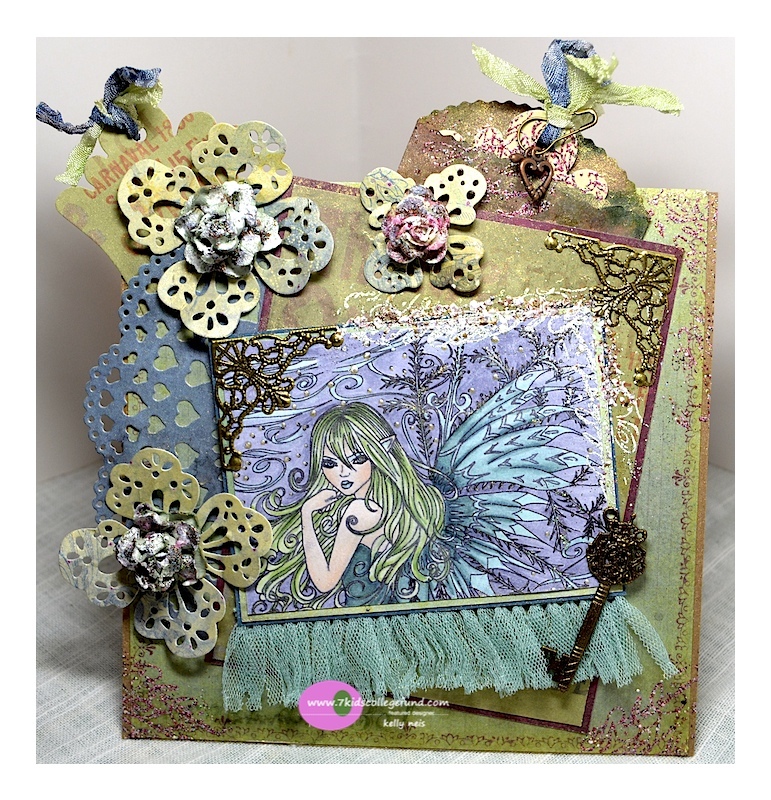 Lovely coloring and fabulous dies! Please tell this Snowflake Fairy that Spring is almost here and we have enough snow and ice. Gosh this has been a hard winter. Anyway you have created beauty! Such a pretty image and you have used glorious colors. I do love Frantage! Wonderful tag at the top! Did I tell you how much I love your colors!!!! So very beautiful! Love the colors you chose and all your pretty flowers. Another masterpiece. wooooow!! this card is simply fabulous! love everything on this!! Wowwwwww Kelly! This is so GORGEOUS .. as always!!! I love the rich gold tones to this and the mystical feel of this! STUN-NING beyond words!!!!!!! !